Linda Carleen Smith Foster left this world behind on May 13, 2018. She was born to Coy Leo Smith and Jean Bettis Smith on October 16, 1943, in Laredo, Texas, where her father was serving in the U.S. Army Air Corps. Known to her family as Carleen, she graduated from Crane High School at Crane, Texas, in 1961. She completed Draughan's Business School and moved to Higgins, Texas, to work for the local physician, Dr. G. H. Hart. Old flames were rekindled and Carleen married Frank Foster on April 14, 1962, at Higgins. Later that year, Frank entered the active U.S. Army. This began many years of Carleen being a military Mom for their two daughters, Kereigh Suzann and Brenda Kay, during the many moves and deployments. The family moved to Russellville in 1973. 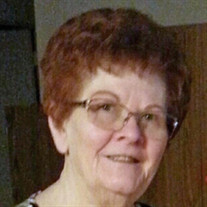 Carleen was active in school organizations in addition to working at several businesses. Her involvement in school activities resurged after the adoption of Jenna Lovejoy in 1992. In 1997, she established Loving Care Firm which exists today. She was a member at West Side Church of Christ in Russellville, where she was a teacher and active in Lads to Leaders and CHRISTeens for many years. Preceding her in death were her father Coy Smith; step-father Robert Green; and, step-father V. B. Smith. Also preceding her were daughter Jenna Lovejoy; granddaughter Shenna Lovejoy; parents-in-law, J. R. and June Foster; and her son-in-law's parents, Lester and Lucille Roberds. Surviving are husband Frank Foster; daughter Kereigh and Walter Roberds; daughter Brenda Foster; grandson Jeffrey Roberds; great granddaughter Ellie Fugate, all of Russellville; grandson Joseph Roberds of the U.S. Air Force; mother Jean Smith; brother Gary Smith; sister Glenda and Bill Brookshire; all of Celeste, Texas; plus many aunts, nephews, nieces, cousins, and friends. Cremation is under the direction of Humphrey Funeral Service. A memorial service will be held at Humphrey Funeral Chapel on Thursday, May 17, at 2:00PM, with family visitation preceding from 1:00-2:00PM. A private committal will be held at Rest Haven Memorial Park. Memorials may be made to Camp Caudle, 857 SR 164 N, Hector, AR 72843. Internet obituary and online guest book are available at www.humphreyfuneral.com.